A glitchy time machine strands a bumbling janitor and a brilliant scientist in the distant past. Can they find their way home before they're attacked by angry cave-men or eaten alive by a saber-toothed tiger? Find out in this fast-paced, funny tale spun from a real-life kid's imagination! "Changing kids' lives, one story at a time" is the motto of the Story Pirates, a group of performers who bring kids' writing to life through sketch comedy. 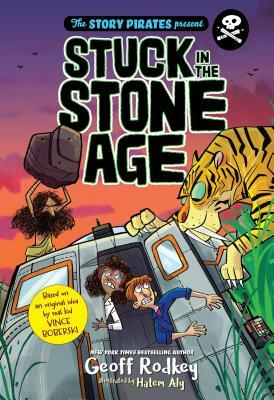 Stuck in the Stone Age is an action-packed mystery based on an idea from a real kid! Teaming up with New York Times bestselling author, Geoff Rodkey, this spine-tingling mystery doubles as an introduction to the basics of creative writing. With the help of the extensive back matter called the Mystery Creation Zone, readers can use this novel as inspiration to create their OWN great mystery! The Story Pirates are a nationally respected media and education organization founded in 2004 to celebrate the words, ideas, and stories of young people. Their motto: “Changing kids’ lives, one story at a time.” They’ve been featured on NBC Nightly News, TODAY, and Sesame Street, and are endorsed by Jon Stewart, Conan O’Brien, John Oliver, and more. Geoff Rodkey is the New York Times bestselling writer of the Tapper Twins and Chronicles of Egg books, as well as the hit films Daddy Day Care and RV. He lives and works in New York City. Visit him at geoffrodkey.com. Vince Boberski writes short stories and funny songs, plays saxophone in his school band, and likes to play basketball, and his favorite Grizzlies player is Mike Conley. He lives in Memphis, Tennessee, with his mom and dad, a little sister who sometimes gets on his nerves, and two dogs named Daisy and Lucy who don't. "Time travel, cavemen, laughs, and a perfectly paced manual on story creation. Children's performing group the Story Pirates chose 11-year-old writer Vince Boberski's idea for a book and handed it to Rodkey, who turns it into the tale of a janitor named Tom Edison (not that one) who dreams of becoming a scientist (despite an H in Physics). After a time-machine accident, Tom and shy, brilliant scientist Dr. Marisa Morice are trapped in the Stone Age with sabretooth-tiger-worshipping cavemen. How will they get back to their own time? At key points in the tale, cartoon versions of a Story Pirate and Boberski break in with a question about a story element. Readers can continue with the story or flip to a specified section of the "Story Creation Zone" that makes up the final quarter of the volume. The narrative of Tom and Marisa's adventure is sarcastic, funny, and entertaining enough to interest on its own, and the short (and also funny) instructional lessons on character creation, story setting, plot twists, climax building, and story endings are pitched to pique interest and get the creative juices flowing. Aly's cartoon illustrations will add a giggle or two or three. Marisa appears to be black and Tom white, and naming conventions point to a diverse supporting cast. A must for young writers (even those not interested in sci-fi) and a fab, fun writing manual for writing teachers everywhere." "Jam-packed with both writing advice and jokes... this two-for-one tale is as smart as it is entertaining." What an amazing read, full of bizarre kid logic and fun, and brought to life with the usual care & empathy that the Story Pirates always show to young writers! Do you want to laugh? Or get yanked into a nonstop, page-turning adventure? Or be inspired to write your own story? Or maybe you want to eat a double stack cheeseburger with onion rings? Okay, if it’s any of the first three, then this is the bookfor you. If it’s the last one—sorry, we can’t help you there. So zany and imaginative, it's no surprise an actual kid inspired it. You'll laugh a lot—and learn a lot, too.